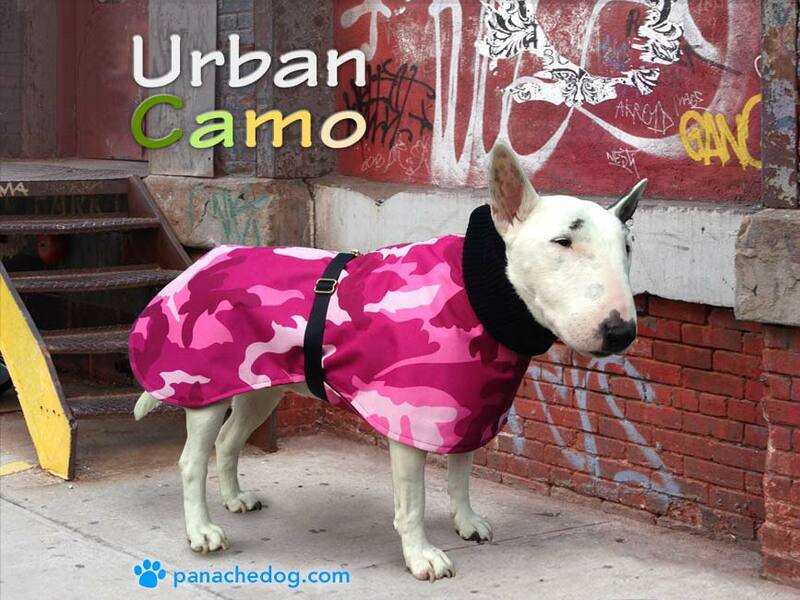 Panache Dog Rain Coats line. We offer two choices of raincoat, a lightweight raincoat, which is designed to protect your dog from the rain, and a warm camouflage raincoat, which will protect your dog from the extreme cold and rain. Our Panache Dog raincoat is made of a light weight (100% polyester) fabric that is soft to the touch and fully lined with a mesh fabric. It is designed ultimately to protect your dog in short walks, especially when he/she needs a bathroom break. Our lightweight dog raincoat comes in a choice of 3 colors, hot pink, turquoise and olive green with black trim and black mesh lining. Our coat is available in a large selection of sizes, from small to an X large. Our large dog rain coat and X large dog rain coat will fit (for example) a Golden Labrador, Labra doodle, Golden Retriever, Doberman and German Shepard. Like all our dog coats, this coat comes with a chest protector for underbelly protection. It also has a belt, all stainless steel hardware, that is adjustable, to create a snug fit. Fully washable this is a great coat to have, also ideal in warmer weather for heavy showers. Please note due to the fabric choice our lightweight raincoat is not suitable for huge heads, this fabric is treated with a PVC and does not allow the ‘ stretch and give “ of other fabrics. If you are looking for a coat for big heads please look at our denim coat and our polar fleece coats. Our Panache Dog lightweight raincoat is designed for short periods in heavy rain, it will not protect your dog if you wish to go for long walks. Our lightweight dog raincoat comes with a free drawstring bag. Designed for maximum warmth in wet weather, rain or snow this winter raincoat will protect your dog from heavy rain or snow for long periods, also extreme sub zero temperature’s. 1. Designed as a multi purpose coat, our Camouflage coat is a very warm winter coat and also a waterproof raincoat. 2. The outer camouflage fabric is made of a “Pro Tuff Waterproof 20 Ounce Woven fabric” PVC coated, which is extremely durable and waterproof. 3. Our coat is fully lined in a soft and very warm black polar fleece fabric. 4. Our coat features a rib knit polo neck that can unfold for extended warmth (to protect the ears) or folded double for maximum neck warmth. 5. Our coat has a chest protector for underbelly waterproof protection. 6. Our coat has an adjustable belt, stainless steel hardware, to ensure a comfy and snug fit. 7. Available in a choice of sizes, from small to X Large. This coat will fit large dogs and extra large dogs like an American Staffordshire and a Golden Retriever. 8. Available in trendy pink camouflage with black polar fleece lining for the girls, and a military green camouflage with black polar fleece lining for the boys. 9. Black rib knit necks and black belts. 10. Exclusive only to Panache Dog. Due to the fabric choice, our Camouflage warm raincoat is not suitable for huge heads. The fabric is treated with PVC, so does not allow the stretch and give like our other coats. If you are looking for a coat to fit a big head please look at our denim coat and also our polar fleece coats.